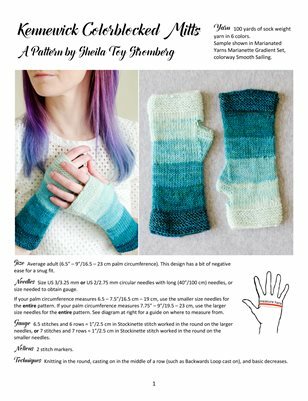 A print copy of the pattern Kennewick Colorblocked Mitts by Sheila Toy Stromberg, knitorious SHE. The pattern is for adult fingerless mitts. It uses sock weight yarn and features very basic shaping to be suitable to beginners.